This is good news. The question is when is he going to act on this desire and reverse his previous actions of restricting legal immigration? If we want less illegal immigration, then increasing legal immigration would be the simplest way to accomplish that. Funny how all the Trump-lovers are screaming at those who call the "emergency" act from Trump unconstitutional, while Mr. Bait & Switch Trump is the actual reason for the increase in immigrants at the border. They also can't see that he is once again establishing precedent among the party of "R", a term that was unheard of before: "illegal". Of course this will align with "fair labor", reduction/elimination of Contract Rights, and set immigrants up to not only be eligible for government programs, but also supply tax money to the FED. That Great Wall will ASSIST in that effort. And notice in that quote, even this immigration restrictionist writer at Breitbart admits that most of the foreign nationals showing up at the southern border are there because they want American jobs. Not because they are trying to get on American welfare or engage in lives of crime here. If we let these foreign nationals in, they would be a boon to our economy, not a drag. And the only reason for these people to cross the border illegally is because no legal means of doing it is afforded to them. Just let them in legally, and voila, illegal immigration will practically disappear. But the immigration restrictionists won't have that, because, while most of them may say that they're only against illegal immigration, and not against legal immigration, they don't really mean it. Last edited by Superfluous Man; 03-08-2019 at 09:04 AM. Get this through your thick dumbass skulls. Illegal immigration, which involves walking across a border, demanding rights and benefits while waiving the flag of the $#@!hole country that was fled, is bad. Just let these people immigrate legally (which you yourself say is good), and the incentive for illegal immigration will practically disappear. My only quibble is that becoming a citizen should be left out of the equation. Just because somebody comes here and stays a long time, even the remainder of their life, doesn't mean they should necessarily become a citizen. Now if only Trump will actually follow through on this. So much for the site mission. Now I know why so many left. You must spread some Reputation around before giving it to Ender again. Ohhhh. From what spudea said, I just assumed he (she?) was referring to immigration restrictionists as dumb asses. That's really the only sensible way to take it in context of claiming that legal immigration is good (assuming spudea was being sincere in saying that). Was that directed to us? I'm not really sure at this point. I took spudea's comment literally, as in "legal" immigration should be advocated and "illegal" is bad, putting no responsibility on the .gov or the bureaucrats who give them free handouts. Undocumented ie: "illegal" should receive NOTHING. But be allowed to enter as long as they commit no crime against another. I took it literally too, meaning that those people who cannot now immigrate here legally, should be allowed to do so. Then it would be legal immigration, and not illegal immigration. "Allowed" meaning it should be legal. Right? I believe in the freedom to travel freely. Unless a crime has been committed against another human being or private property, nobody has a right to ask for "papers please" or where you are going. If a crime has been committed, there are already laws to address that. Exactly, so just like spudea, I think legal immigration is good, whereas making it illegal is bad. Assuming spudea really meant that. I am having great difficulty with legal/illegal. "Legal" is a legal term, which defines what is permissible, ie: conditions. "Illegal" is a also a legal term, which defines what is not permissible, ie: conditions. "Undocumented" is the proper term, which defines no conditions. Which is what liberty/freedom is all about. "Legal" just means it doesn't violate a law. If immigration is not illegal, it's legal. According to Natural Law, yes, I agree. But government/politicians define it much, much differently. advocating and encouraging people to do the right thing, follow the law and the process to come here and work legally does not in any way promote or advocate for people to do the wrong thing and violate our rules and immigration law. The immigration laws are the same as when Trump took office. Twisting this to suggest Trump is promoting illegal immigration is false. The immigration laws are the same as when Trump took office. Trump has now repeatedly said that he wants to change that and make it easier for more people to immigrate here legally. Twisting this to suggest Trump is promoting illegal immigration is false. What Trump is promoting is legalizing much of the immigration that is currently illegal. But then it wouldn't be illegal any more, of course. So if is good for the economy, my taxes will go down? If Congress passes more tax cuts, which they certainly should. To give credit where due, MAGA has shown strong leadership and is already building bridges with our closest neighbor. 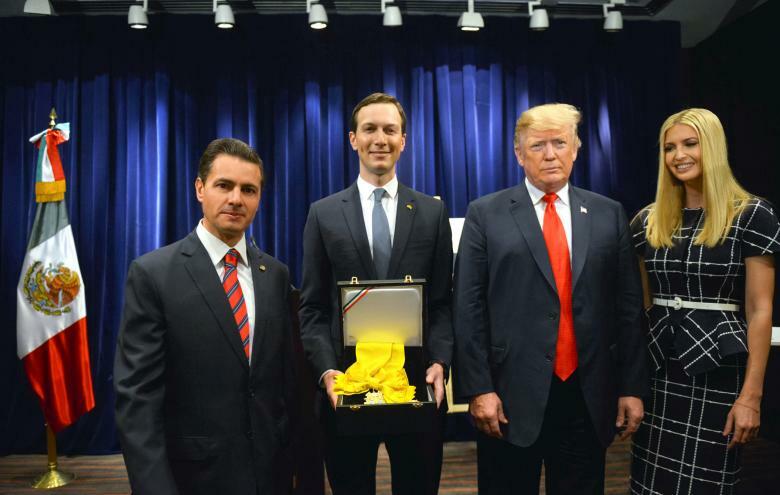 Jared Kushner, Trump and his daughter Ivanka after Kushner received highest award Mexico gives to foreigners, Order of the Aztec Eagle, from Pena Nieto. It's going to be really funny when Trump's base figures out he's betrayed them. He's not the man many think he is. In fact I think I could like him but for (some) of his supporters. Although extreme conservatives like Ann Coulter, Tucker Carlson were reportdely banned from speaking at CPAC 2019, to be fair to win 2020 election MAGA seems to be making bit of a liberal/globlaist shift lately in its messaging apparently aimed to court hispanic, lgbt , semitic minority votes that GOP usually does not go out of its way to court. Last edited by enhanced_deficit; 03-08-2019 at 12:00 PM. We're nowhere close to full. North of the Mexican border, this continent is vastly underpopulated. This lack of human resources is holding us back from our economic potential. Stopping people who want to work from coming here to do so is self-destructive. I wasn't twisting anything- just pointing out the whole "caravan" scare is because of The Donald. Most people have no concept of the difference between "lawful" & "legal". I think El Jefe' Naranjo is $#@!ing nuts...I'm done trying to figure out if this is more "Drunken Monkey" sparring, or the right hand reasoning that makes excuses for the migrant invasion, or just the rantings of an idiot. Bottom line is millions more are coming, more wages will be driven down, more displacement will take place, more trash and filth and crowding will take place, more third world socialists will be elected to power and more freedom will be lost. Apparently those jobs reports and low unemployment numbers are making the Federal Reserve very nervous. Before you know it, wages will increase and the debt pyramid might collapse under inflation. Trump loves debt. 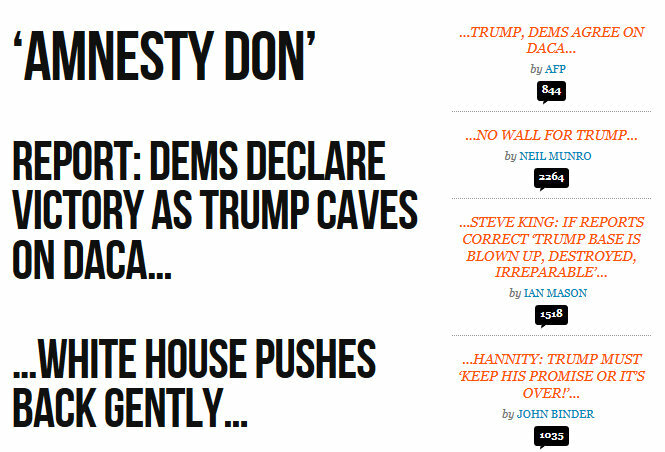 Breitbart 2015: Trump: "I'd expedite legal immigration process for illegals deporting them"